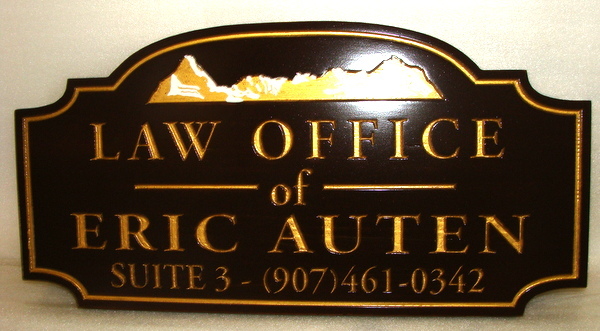 Above is shown a sign for a law office with 3D engraved text and a 3D mountain range. This is one of over 250 attorney and law signs in this Gallery 10, and one in over 6000 different custom sign and plaque designs displayed in 45 indexed and organized photo galleries on this site. This handsome sign projects professionalism and class, yet is unique because of the image of mountains at the top -black , 24K gold-leaf, and white accents (for snow-capped peaks) are very effective here.